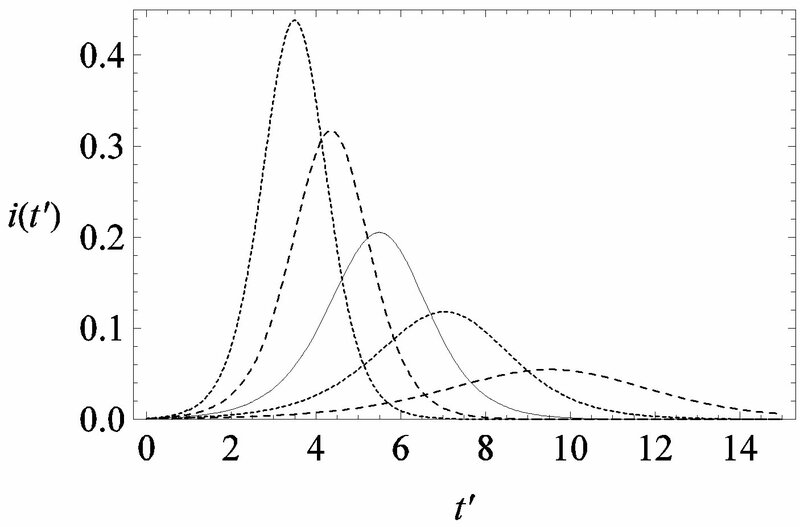 The effects of the incubation period q on the dynamics of non-lethal infectious diseases in a fixed-size population are studied by means of a delay differential equation model. It is noted that the ratio between the quantity q and the time τ for recovering from the illness plays an important role in the onset of the epidemic breakthrough. 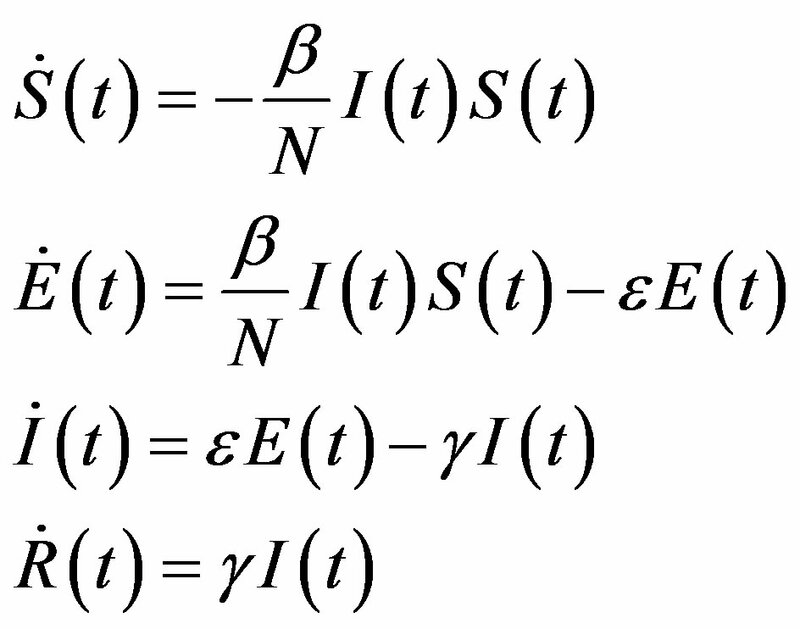 An approximate analytic expression for the solution of the delay differential equation governing the dynamics of the system is proposed and a comparison is made with the classical SEIR model. 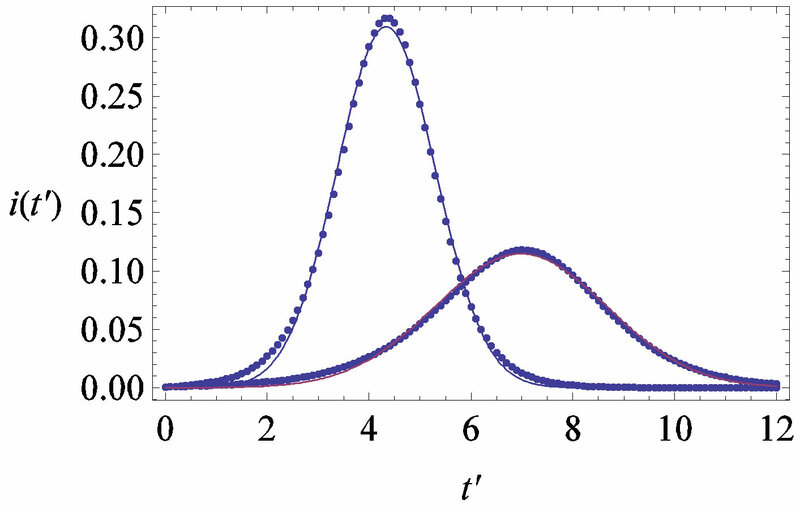 where the dot represents derivative with respect to time and is the total number of individuals in a fixed-sized community and where the parameters are β and γ are the effective infection rate and the recovery rate, respectively. 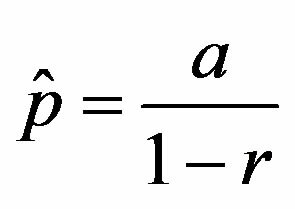 The above set of differential equations can be reduced to two by means of the definition of N given above. Here an exponential distribution of the recovery time is assumed, so that the quantity 1/γ corresponds to the average period which a single individual spends to recover from the illness. Adopting the above description of the time evolution of the number of individuals belonging to the three classes, one can see that an equilibrium point appears in the system if . In the classical SIR model is the basic reproduction number, which accounts for the average number of successful contacts an infectious individual has with a susceptible one at the first appearance of the illness in the community. where the exposed (E) class of individuals, whose number at time t is , is added. In this way, assuming an exponential distribution of the quiescent period the inverse of the additional parameter ε represents the average quiescence time of the illness. Notice, finally, that the total number of individuals is now given by . In the present work we extend the NRD model to the case in which a constant quiescence time q is introduced. The effects on the dynamics of the two time-delays τ and q are studied and an approximate solution for the extended NRD model is proposed. A comparison between the classical SEIR model and the extended NRD model is also made. The above relation is needed in specifying the past history of the system, whose dynamics is described by the DDE in Eq.6. We may notice that the extended NRD model can find application for all those maladies whose characteristics call for well-defined incubation and recovery periods for all individuals in the community. We shall therefore see in details, in the following sections, all peculiar features of the model. 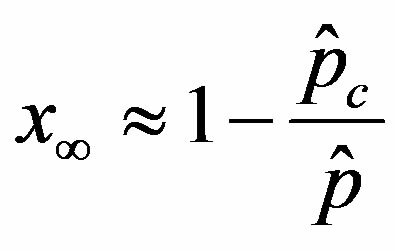 We finally notice that the NRD model can be simply obtained from the extended NRD model in the limit q = 0. By defining , we notice that the above differential equation can be described in terms of the normalized variable of the count of individuals who got ill from the beginning of the epidemic onset, by considering the delay ratio r, the initial value of infectious individuals m0 and as the constant parameters of the scalar model in Eq.9. Notice that the quantity , by definition, plays the same role as the basic reproduction number R0 in the classical SIR and SEIR models. In the present work we would like to study the effect of the introduction of the delay ratio r in the DDE (9). At first let us then consider the time dependence of the percentage of infectious individuals obtained by fixing the values of m0 and . In figures 1(a), (b), therefore, we show the numerical solution to Eq.9 for and and for various values of r. In these curves we notice that, by increasing r from the very low value of 0.01 to 0.5, the total number of individuals infected during the epidemic outbreak decreases. Figure 1. Time dependence of the function , normalized to N, for x0 = 0.001 and = 2.5, and for: (a) r = 0.001 (full line), r = 0.1 (dotted line), r = 0.2 (dashed line); (b) r = 0.3 (full line), r = 0.4 (dotted line), r = 0.5 (dashed line). Figure 2. Dependence of the normalized saturation number of individuals getting ill during an epidemic outbreak as a function of the delay ratio r for and = 2.5. The full line is just a guide to the eye. guide to the eye. Therefore, one might argue that increasing incubation periods give a minor spread of the disease among the global population. In figures 3(a), (b) we report the time dependence of the fraction of infected individuals for the same values of parameters as in figures 1(a), (b). 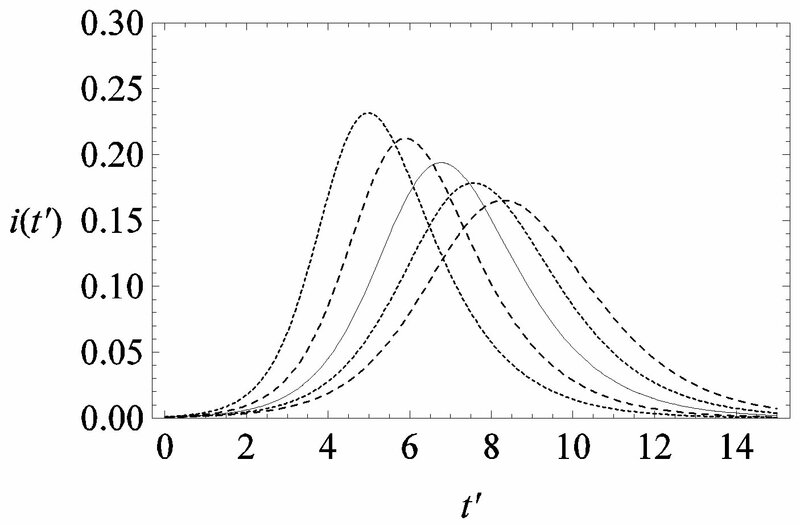 The characteristic hump of these curves gets lower and shifts to the right for increasing values of r. In figures 4(a), (b) the onset of the epidemic outbreak can be detected in the curves of the fraction as a function of . Figure 3. 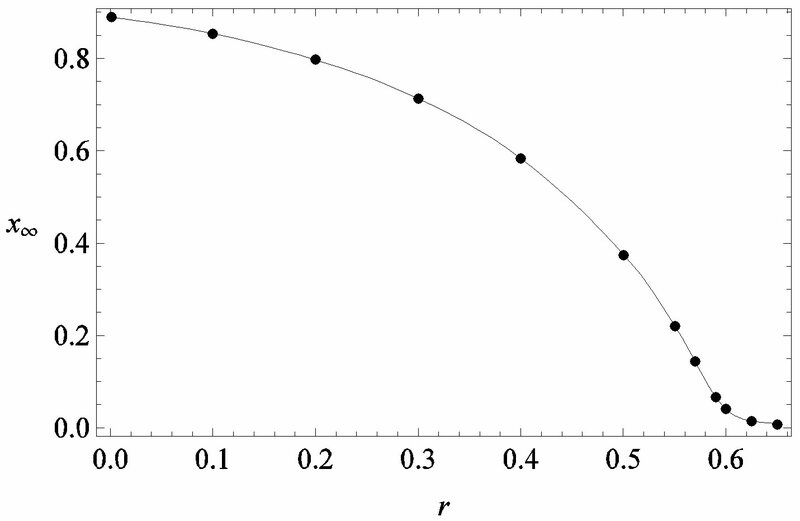 Time dependence of the function , number of infectious individuals normalized to N, for and = 2.5, and for: a) r = 0.01 (full line), r = 0.1 (dotted line), r = 0.2 (dashed line); b) r = 0.3 (full line), r = 0.4 (dotted line), r = 0.5 (dashed line). we denote by , the disease is not able to spread significantly among the susceptible individuals, as it happens in the classical SIR and SEIR models. As it appears from figures 4(a), (b), the value of is expected to be higher for increasing values of r. Indeed, by collecting points of various critical effective interaction parameter for various values of the delay ratio r, we may represent the vs. r curve for of figure 5. In this plot all points are obtained by defining the onset of the disease in the vs. curves as the value of for which . The continuous line is the result of interpolation of the points in the plot, numerically obtained from the vs. curves, with a trial function , with . 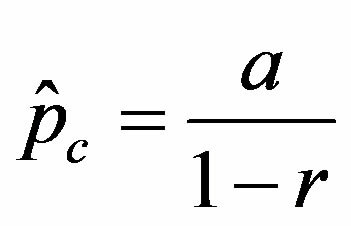 This simple mathematical relation can be understood in the following way. 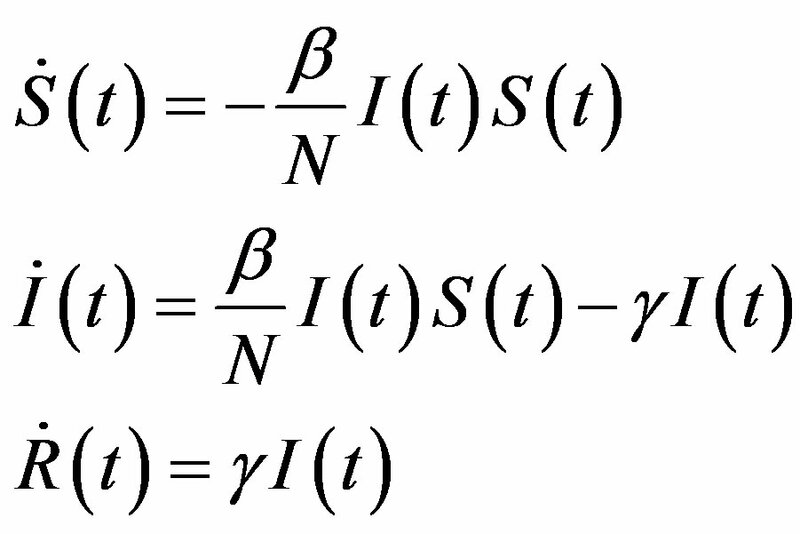 Assuming an increasing behavior for , let us write, for reasons which will be apparent in the following section, in the limiting region , with b arbitrary constant and . Figure 4. 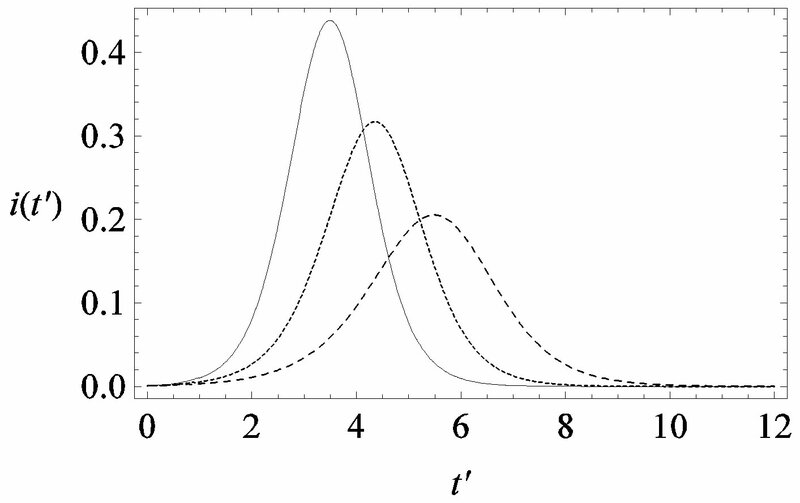 Dependence of the normalized saturation number of individuals getting ill during an epidemic outbreak as a function of the effective parameter for and for delays ratios r = 0.2 (a), and r = 0.3 (b). Figure 5. 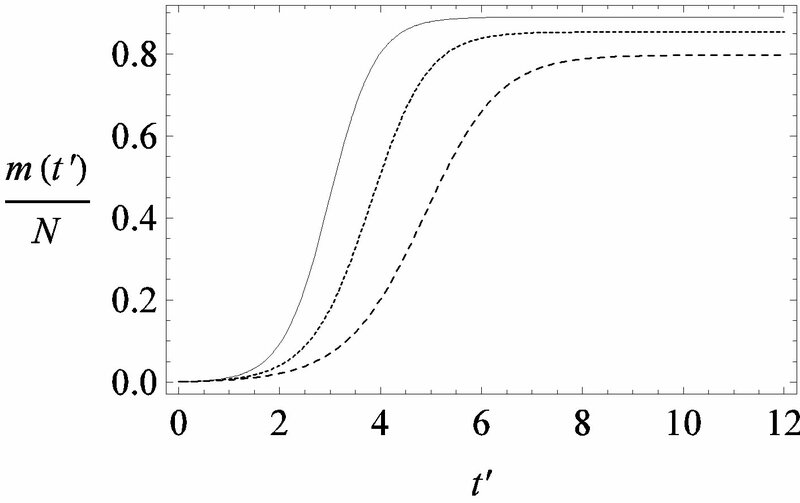 Critical effective interaction parameter as a function of the delay ratio r for . In this plot all points are obtained by defining the onset of the malady in the vs. curves as the value of for which . The continuous line is the result of the interpolation of the points in the plot, numerically obtained from the vs. curves, with a trial function with a = 0.9048. 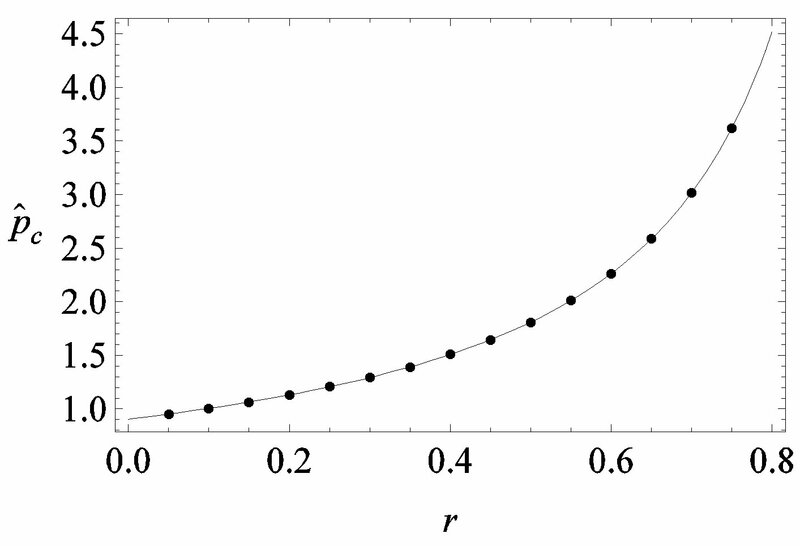 We thus obtain, by this approximate relation, further evidence that the threshold of the infectiveness parameter increases as r increases as described by the numerical results shown in figure 5. We can now make a comparison between the dynamics obtained in the extended NRD model and the classical SEIR model. We have already specified that the quantity plays the same role as the basic reproduction number R0 in the SIR and SEIR models, Eq.12 giving an approximate evaluation of the threshold infectiveness parameter value for the extended NRD model. In the classical SEIR model, on the other hand, the inverse rates and corresponds to the average times which a single individual spends in the E or I class, the statistical spread being exponential. The classical SEIR model and the extended NRD model are thus expected to be of different analytical nature, the latter calling for well defined recovery time τ and incubation period q. As an example one can detect this difference in the time dependence of curves for both models by setting and , so that , adopting the same values of the parameters and and making the correspondence for the two models. This comparison is very instructive, since it gives a hint on the type of approximation one can make to describe the behaviour of the solution in the asymptotic region, as it has already been done in writing Eq.10. 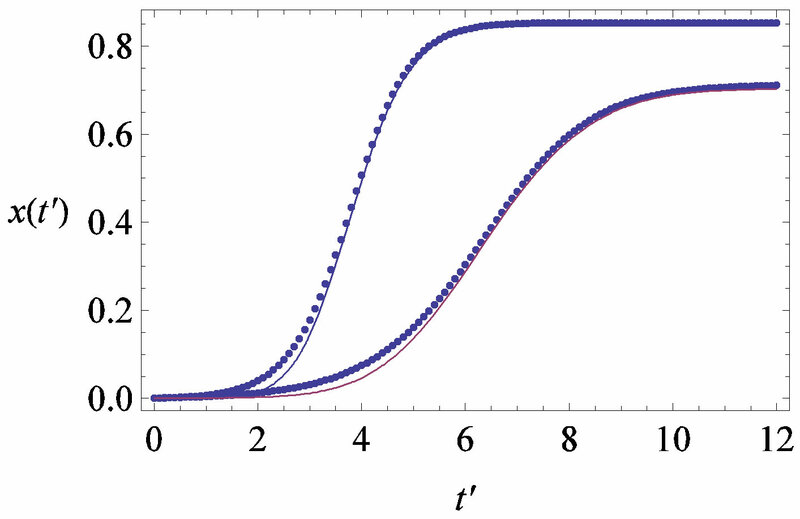 Therefore, in figures 6(a) and (b) we show curves for the classical SEIR model and the extended NRD model, respectively, for the following values of the delay ratio r: 0.01; 0.1; 0.2; 0.3; 0.4. 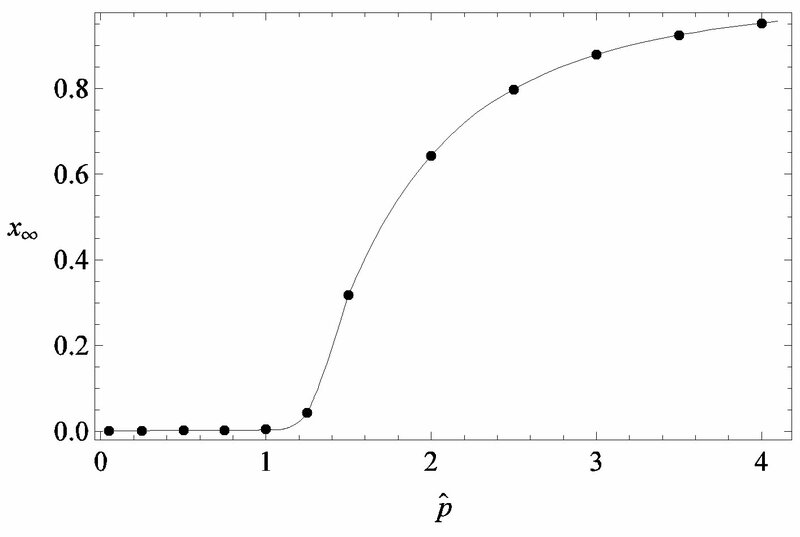 First of all, we may notice the different pattern in the rise and fall in time of the groups of curves in figure 6(a) and in figure 6(b). This difference and the approximately symmetric pattern about the peak values of the curves in figure 6(b) allow a Gaussian-type approximation of the curves obtained for the extended NRD model, as we shall see in the following section. Furthermore, one may also notice a more pronounced decrease of the peak values of the curves on increasing the delay ratio r in the extended NRD model, as compared to a correspondingly equal increase of the ratio in the classical SEIR model. Figure 6. 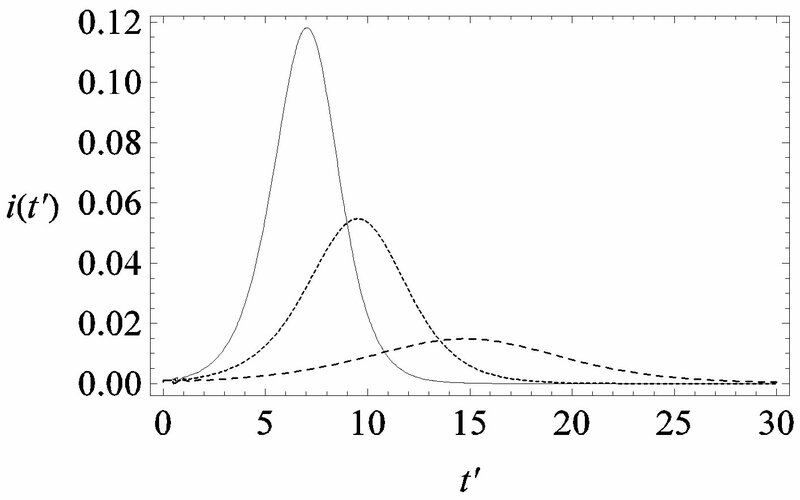 Graphical representation of the solution of the fraction of infectious individuals in the SEIR model (a) and in the extended NRD model (b), for , , and for the following values of r: 0.01 (top dotted line); 0.1 (top dashed line); 0.2 (full line); 0.3 (bottom dotted line); 0.4 (bottom dashed line). Figure 7. 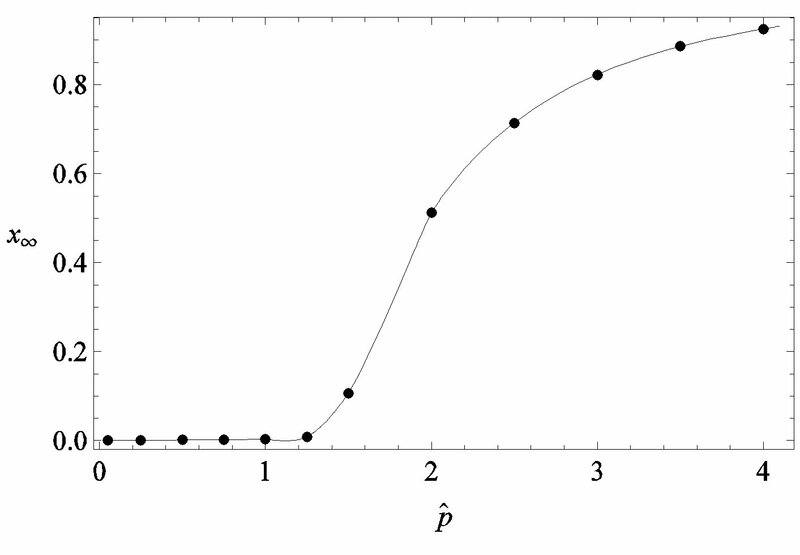 (a) Numerical integration (dots) of the curves for the extended NRD model along with the approximate solution (full lines) for the following choice of parameters: , x0 = 0.001, and r = 0.1 (tall curve) and r = 0.3 (shallow curve); (b) Numerical integration (dots) of the curves for the extended NRD model along with the approximate solution (full lines) for choice of parameters as in (a), except for the delay ratio, which is taken to be r = 0.1 and r = 0.2 for the upper and lower curve, respectively. The above relation gives similar results to figure 2 and 4 with the advantage of providing a very simple expression for the total number of individuals getting ill during an epidemic outbreak. The NRD model , describing the time evolution of non-lethal infectious diseases in a fixed-size population of N individuals, has been generalized. 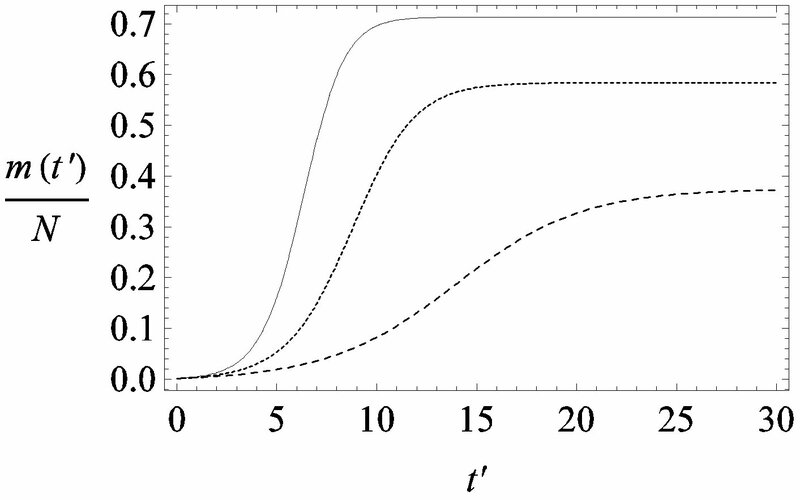 In the extended version of the NRD model a quiescent time q, in addition to the recovery time τ, is taken as a delay quantity in the dynamics of the infection. The NRD model is recovered from the extended version by setting q to zero. The influence of the delay ratio on the model dynamics is studied. It is seen that the model predicts that a longer incubation period mitigates the effects of an aggressive infective agent ( large). Indeed, as it can be argued from the monotonically decreasing behaviour of the fraction of people infected during an epidemic outbreak in the vs. r curves obtained for a fixed value of , the number of total infections decreases as r increases. Furthermore, the critical value of the statistical parameter , giving the effectiveness of the interaction between susceptible and infectious individuals, is seen to increase for increasing values of r, according to the empirical formula , where the quantity a is close to unity and may only depend upon the remaining model parameter , which represents the number of infectious individuals at time t = 0. From a comparison between the classical SEIR model and the extended NRD model, one can detect a rather evident symmetry of the latter about a vertical axis passing through the peak values of the curves. Owing to these rather simple features, an analytic approximation of the solution of the dynamical equation for normalized variable is proposed. The analytic approximation of the solutions to the dynamical equation is shown to be rather accurate in the asymptotic region. Further analytic work is required to investigate the possibility of reducing, in opportune limits, the number of free parameters adopted in deriving the approximated curves.